For some time now, there have been issues in V/Line relating to the guaranteed fortnight which is in the V/Line Rail Operations Enterprise Agreement 2015 – 2019. Issues were around a staff member arriving to work late and the company docking their guaranteed fortnight from the staff member. Under clause 59 of the V/Line Agreement, this should not have occurred. The V/Line Agreement guarantees a 76 hour fortnight for staff, and under no circumstances should a staff member have this taken away from them. The issue was raised with the RTBU and since then, the guaranteed fortnight issue has now been resolved. However, we have since become aware that our members have received letters from V/Line which highlight instances where they have been late to work on numerous occasions. Some instances raised by V/Line go back some three or even five years. V/Line states that the letters are not a formal warning, however, they go on to say that the letter will remain on the individual employees file and that further instances of lateness may result in disciplinary action. This is unacceptable and the RTBU has written to V/Line demanding that the letters be retracted asap. Since then, we have met to discuss the issue and the RTBU has been attempting to work through this issue with V/Line management. If this is not eventually resolved in coming weeks, the RTBU will be formally disputing this and this issue could end up in the Fair Work Commission to be resolved. For too long, public transport workers have been facing physical and verbal abuse from the travelling public. With assaults continuing to worsen over the last few years, it is time that the Victorian Government stand up and make a change to protect public transport workers. No worker deserves to be abused at work. When trains are cancelled or delayed, or simply people are disgruntled by the transport operator, often this anger is taken out on the human face that might sell tickets or provide customer service. Public Transport workers are proud of the work we do and want to feel safe in serving the community. Therefore, the RTBU is running a safety campaign to pressure the Victorian Government to introduce legislation and minimum sentencing for assaulting a public transport worker. While this only affects a minority of the population, this legislation will make a big difference to our members safety on the job. With over 150 assaults on front line public transport workers in the past two years, it is time action was taken to protect you, the workers who keep the system moving. Unfortunately, the RTBUs calls for increased safety measures such as two-up Conductors and Barrier Staff have been ignored and rejected by both Government and the companies. 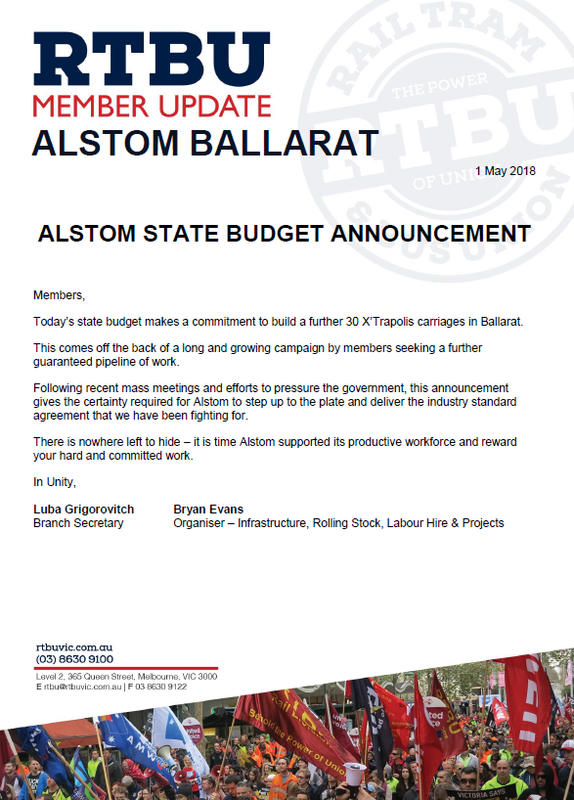 While safety should be the number one priority, it seems that profits are once again coming first, and the safety of RTBU members, public transport workers is being put at risk every day. In Victoria, Emergency service workers who engage with the public are protected by strict legislation and heavy penalties. It’s time this is applied to essential services too! Unfortunately, in the last week we have seen this legislation blatantly ignored by a Judge who came to the decision that two women who severely assaulted an ambulance officer would not be jailed for their crimes. This is an absolute disgrace. A roadshow of meetings is currently occurring across the network in both V/Line and Metro to inform members and brief them on the campaign. At these meetings, workplace motions have been passed and petitions signed by staff at those locations. Along with this, the RTBU will also be putting up the below motion at this weekend’s ALP State Conference. Customer service workers across our public transport network do an important job ensuring passengers can easily use the system, offer any support necessary and help manage disruptions to keep the network moving. While these customer facing roles offer many benefits to our community such as enhance the amenity of the network to all passengers, improve the interface between the public and the transport operator, and ultimately stand as the human face of our sustainable public transport system, it is front line service staff that are too often on the receiving end of abuse from a dangerous minority of the travelling public. Recent years have seen a spike in abuse towards front line public transport workers. In the past two years alone over 150 incidents have been reported leaving customer service staff feeling more vulnerable than ever. Whether it be verbal, physical or psychological abuse, no worker deserves to be subjected to such pressure in the workplace. Following failures of employers to address these matters within their organisations Victoria must take action to protect these vulnerable employees in their public workplace in order to not only support the safety and amenity of our public transport network, but also ensure that public workplaces are safe workplaces. If you are wanting to get involved or hear more about the campaign, please contact the Union Office on 8630 9100. The RTBU recently stood alongside 1200 union leaders, organisers and rank and file members as the new ACTU Secretary Sally McManus launched the movement-wide campaign to change the rules that are holding back working people, and to fight to bring fairness back to Australia. Our job is to look after our members, and to do that better we need the rules to change. The Industrial Relations system, with the Fair Work Act is too restrictive, too harsh and too pro-employer. These are the rules that we want to change. These are the rules that need to change. On behalf of all workers, as a union movement, we are creating a ‘log of claims’ for conditions that should be standard across all industries. The trap of casualization has affected many workers for a long time now, and more and more we are beginning to see its effects on our own members. Casual employees, who have worked on a regular basis for six months deserve the right to choose to convert to permanent work. For too long our laws have not properly defined casual employment. Working people have the right to stable, permanent jobs. As a union, the RTBU have also supported the Transport Workers Union as food delivery riders have come together to take a stand against unfair pay and unsafe conditions. Classing workers as individual contractors has seen people paid below minimum wage, denied access to workers’ compensation, denied sick leave, superannuation, access to unfair dismissal and denied the benefits of collective bargaining. Everyone deserves these rights. Labour hire needs a complete overhaul. Labour hire companies simply rent out workers for lower pay and less job security. It’s got to stop. We need to completely overhaul labour hire companies by creating a national labour hire licensing system to ensure they are not cutting wages and conditions. These workers need protection from unfair dismissal by the host employer, and the ability to bargain with the company so they can win fair pay rises and gain secure work. We need to end the uncapped temporary working visa system. The government is shipping in exploitation and taking job opportunities for locals through its temporary visa system and it needs to end. The system should favour permanent migration and local employment. Temporary visas should only be used for genuine shortages, with strong protections against abuse. We must invest in quality skills for the future. Privatising vocational education and training has been a disaster. We must rebuild the funding for schools, TAFE and universities, and better educate the workers of the future. The government is negotiating “free trade” agreements that sell out Australian jobs. We must only enter into agreements which defend and improve wages and job security. They should not be able to bypass our laws regarding the movement of people just for the benefit of corporations. The government is using our money to buy from overseas, when they should be buying local. Rewrite the Commonwealth Procurement Rules to ensure that the government hires directly and locally, and prefers local businesses which pay fairly and provide secure jobs. an elderly parent. We need to change the rules so people have the right to part time or reduced hours. Plus, workers deserve the right to return to work when their caring responsibilities have ended. Too many people in Australia have no job security. They can no longer predict or plan their lives. Having a job you can count on is a foundation of the Australian way of life. The rules must be changed so jobs with basic security and rights can be restored. People around the country are ready to take action to change the rules and win more secure jobs and fair pay rises. They know big business has too much power, and they know that when working people join together we are mighty and unbreakable. The trade union movement is almost 2 million members strong; we have the power to send a message that we will no longer stand for broken rules. The “Change the Rules” rally will be the largest mobilisation of working people since the Your Rights at Work campaign more than a decade ago. The RTBU calls on all of our off roster members to hit the streets on Wednesday 9 May. Meet the RTBU at 9am at the RTBU Office.